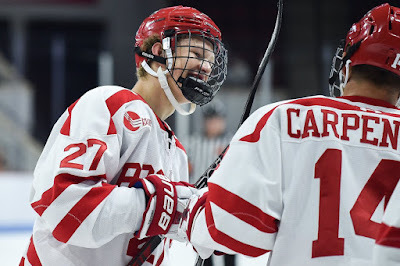 Less than 24 hours after their opening-night win against Union, the #2 Terriers played to a 5-5 overtime tie against the University of Prince Edward Island in an exhibition game at Agganis Arena. With sophomores Patrick Harper, Dante Fabbro and Jake Oettinger given the night off, BU held leads of 3-1 and 4-3, but fell behind in the third period, before tying the score on its fourth power play goal of the weekend. 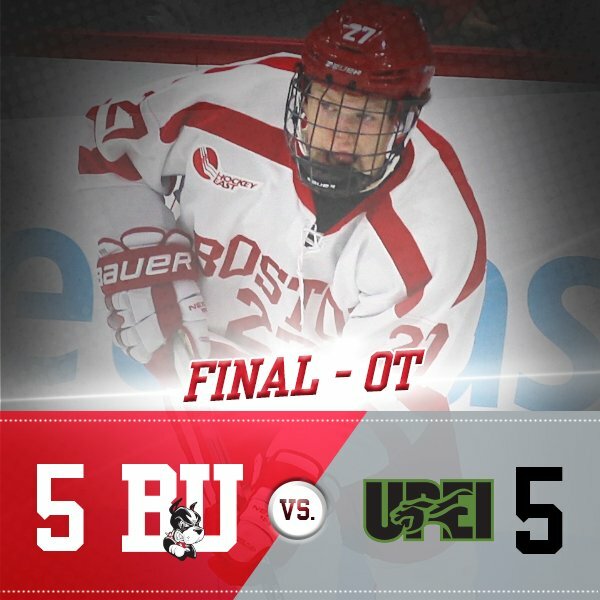 Freshman Brady Tkachuk, who tallied that goal, led the Terrier offense with a pair of scores and an assist. A year ago, BU had thumped PEI, 10-2, in an exhibition game, albeit with a more loaded line-up. Harper had five goals that night and Clayton Keller had a hat trick. BU took a 1-0 lead at 6:50 of the first period. Graduate transfer Drew Melanson forechecked the puck away from a PEI defender to set up freshman Jake Witkowski’s shot from 40 feet out. Panther goalie Matt Mahalak made the save, but sophomore Patrick Curry was on the doorstep to bury the rebound. Less than a minute late, PEI tied the score when Marcus Power potted a rebound after sophomore Max Prawdzik made the initial save for BU. The Terriers regained the lead on a power play with four seconds left in the period when Tkachuk converted the rebound of freshman Shane Bowers’ shot. Sophomore Chad Krys also picked up an assist. BU expanded the lead at the 14:00 mark of the second, again on the power play, when senior captain Brandon Hickey’s wrist shot eluded Mahalak, who was screened by Curry. Assists went to Krys and junior Bobo Carpenter. PEI answered quickly again, with two goals in the next minute and a half, to make it 3-3. But before the period ended, BU regained the lead with its third power play goal, a Krys backhander, assisted by Tkachuk and Hickey. In third, Sam Aulie’s second goal made it 4-4 and the Panthers took their first lead at 7:28 when unchecked Chad Labelle fired a rebound into an empty side of the net to Prawdzik’s right. With just over six minutes left in regulation, Bowers raced into the PEI zone, cut down the slot and dropped a pass to Tkachuk, whose one-timer from the right circle beat Mahalak high to the stick side. Hank Crone also had an assist. BU outshot PEI in the third period, 13-8, and in the overtime, 5-1, and had several good opportunities for a game-winner, but shots by Bowers and Carpenter were stopped by Mahalak, who finished with 36 saves. Prawdzik turned away 21 shots. College Hockey News looks at a pair of Nashville draft picks, Dante Fabrro and Patrick Harper who played pivotal roles in the win against Union and will be keys to the Terriers’ success this season. 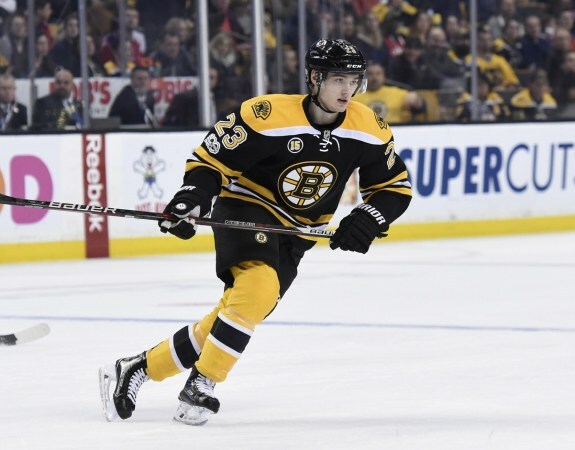 The HockeyWriters.com analyzes the Bruins’ depth at the center position and looks at the role Jakob Forsbacka Karlsson could play.